130.8+/- acres adjacent to the north of the Osage Hills Golf Course with mostly wooded and rolling terrain. Per appraisal, all utilities are adequate and directly available to the site. A convention center concept was envisioned for the site at one time though no formal plans were developed. It would also be ideal for recreational uses and/or private estate development. It is currently zoned R-1, Single Family Residential. 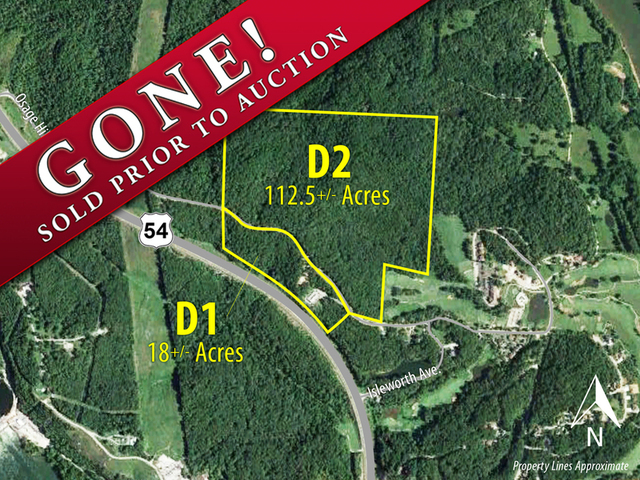 The property has not been previously listed so there is no last list price, however it was appraised in 2010 for $1,240,000 ($9,480/acre). The combined auction reserves are only $270,740. 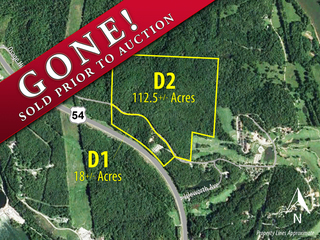 Property D1 is approximately 18.3 acres on south side of Osage Hills Road. It includes 1,800 feet of Highway 54 frontage, but not direct access. A cell tower on the property generates annual income of approximately $10,000 per the Ground Lease Agreement* that transfers with the property. A water well usage agreement with the golf course also goes with the property. 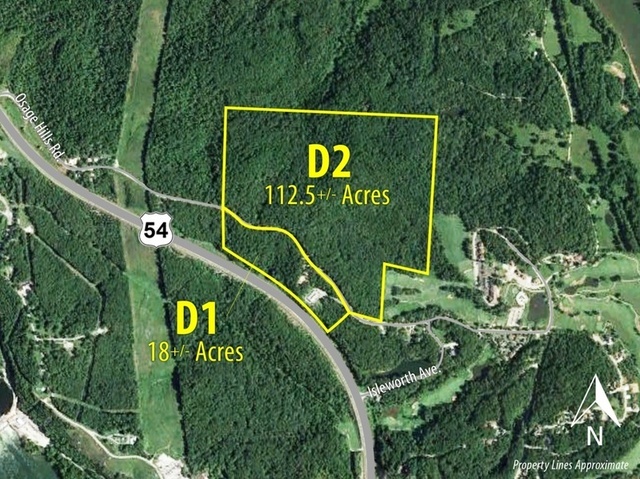 Property D2 is approximately 112.5 acres on the north side of Ozark Hills Road. Seller’s combined reserve: $270,740 (Appraised at $1,240,000) Available upon request. 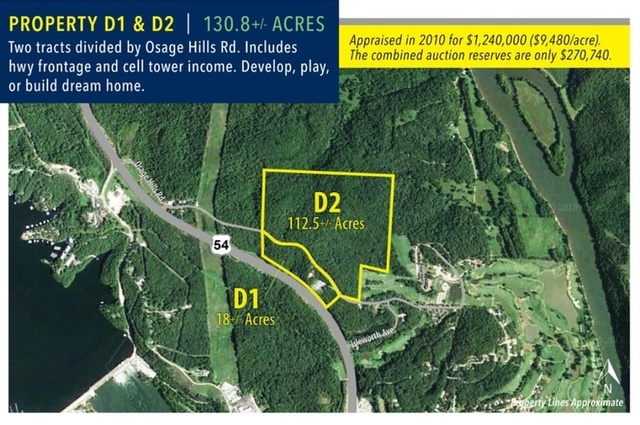 Auctioneer’s Note: These tracts are part of a larger sale of high quality development land and lots at auction, in and around the popular Osage National Golf Resort development. Our seller, an established Cates Auction client, is committed to selling everything and has set reserves well below market value on all these excellent properties. Look through all the materials and visit the sites, then log on and bid your prices! Auction Information Center: In addition to complete details on this website, full auction information is available in the Auction Information Center located in the lobby of the Osage National Golf Clubhouse. Additionally, auction staff will be onsite at the Auction Information Center on April 18 & May 2 from 11:00 to 1:00. Bid in the auction. All bidding will take place online and will end on May 16th. Make a pre-auction offer. Subject to all auction terms and conditions. Call Ray at 816-695-2163 for details. 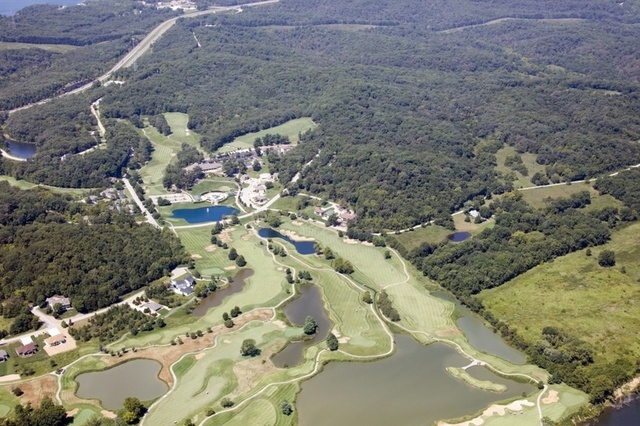 The Osage National Community… Osage National is a 350-lot residential golf course development in Lake Ozark, Miller County, Missouri. 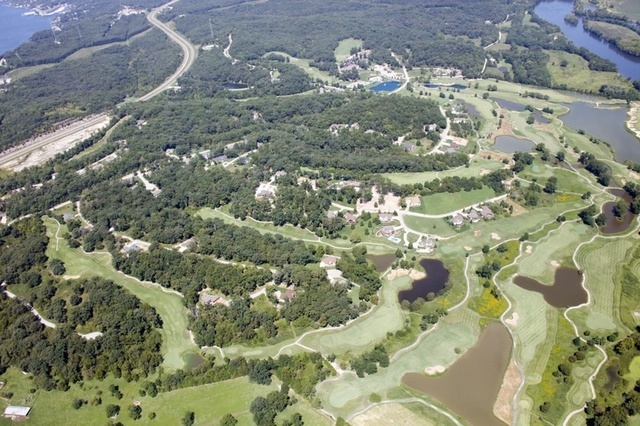 Based around Missouri’s only Arnold Palmer Signature golf course (27 holes), amenities include a full-service club house with restaurant and bar, swimming pool, and more. It is ideally situated on the northeast side of the Lake of the Ozarks area near many of the region’s new and planned commercial construction projects. Lake of the Ozarks… A Vibrant Region with a National Draw. 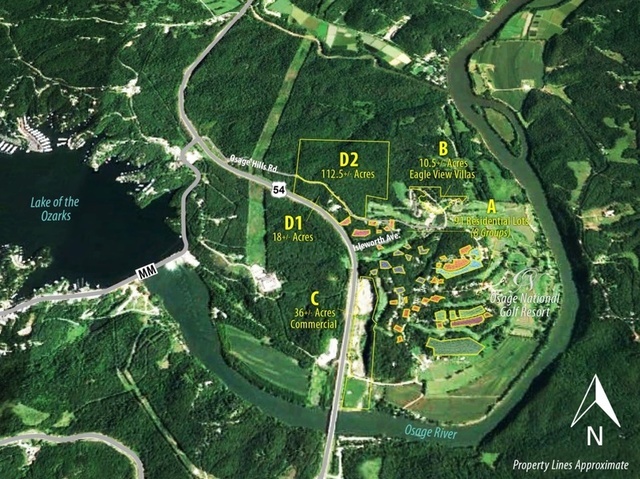 Located equidistant from Kansas City and St. Louis, Missouri, the Lake of the Ozarks was created in 1931 by the damming of the Osage River (see Property C) and resulted in one of the largest and most beautiful man-made lakes in the world. Surrounded by the Ozark Mountains, the Lake is notable for 1,150 miles of shoreline. Sustained population growth over the years supports the significant development of the region as a major second home market and strong tourist/vacation destination. The east side of the lake in particular has seen tremendous real estate development of all types. 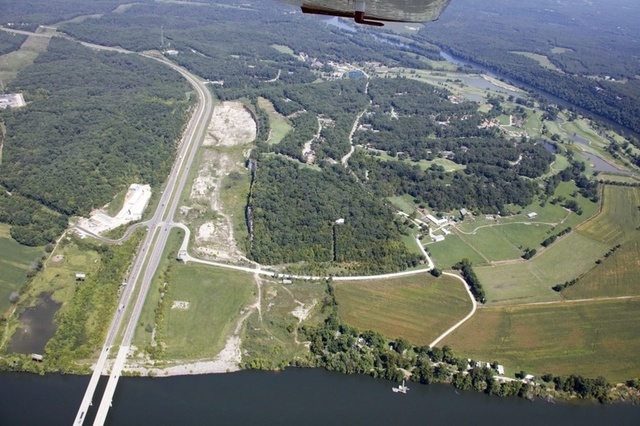 Interstate access exists in all directions, primarily via Highway 54 which links the various Lake communities and has seen the most extensive development in the region. Osage National and these two tracts are located on Highway 54 in the northeast area of the Lake. *Per the Ground Lease Agreement, the sale of Property D1 (or the combination of D1 & D2, if sold together) is subject to a 30-day first right of refusal. Per the paragraph 21 of the Ground Lease Agreement for the cell tower on Property D1, the current Lessee shall have the right of first refusal to purchase the real property being sold by the Lessor on the same terms and conditions. The Lessee has 30 days to give notice of its intention. Directions to AUCTION INFO CENTER: From US HWY 54 Northbound, go east on Isleworth Ave. (approx. 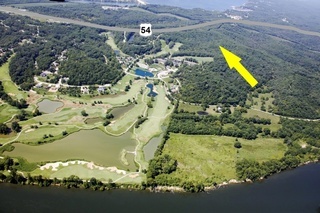 9/10 mile north of Osage River Bridge), to Osage Hills Rd., east to Osage River Bridge Rd., north to Clubhouse. From Southbound US HWY 54, turn east at Osage Hills Rd., follow Osage Hills Rd approx. 1.5 mi. 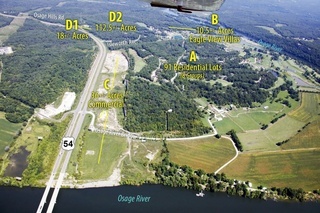 to Osage River Bridge Rd., north on Osage River Bridge Rd to clubhouse.